Introducing Coravin 112015 two Elite Pro, Piano Black, the unique wine system that pours wine without removing the cork so you can enjoy the rest of the bottle another day. Featuring a gloss black finish with chrome accents, the 112015 two Elite Pro pairs perfectly with your kitchen and your taste in wine. The matte black classic base is a perfect place for the system to stay when not in use and the carry case allows you to take it on the go. Extra Coravin capsules keep you prepared. Never again compromise on when and how to enjoy a glass of wine every day. Best-in-class wine system keeps your wine safe from oxidation, allowing it to continue to age naturally. Non-coring, faster pouring needle allows access to wine without cork damage, allowing it to reseal and continue protecting the wine. Argon gas, an inert gas used in the wine-making process, protects the remaining wine from oxidation. Proprietary capsule cap creates a tight seal between capsule and product. Press the trigger to pressurize the bottle, release to let wine pour out. Ergonomic handle and angled spout make wine pouring easy. Bottle clamp with grips makes it easy to attach, providing a secure hold on the bottle, ensuring the system remains stable while pouring. Fits on a variety of sized standard bottles. 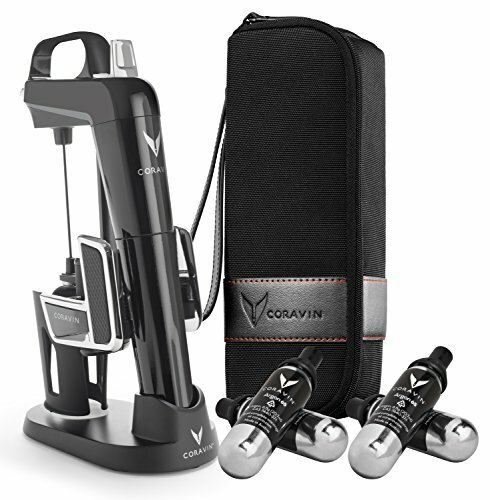 If you have any questions about this product by Coravin, contact us by completing and submitting the form below. If you are looking for a specif part number, please include it with your message. Ohio Stoneware 3 Gallon Fermentation/Preserving Crock Set - Great for Pickling and Sauerkraut! !